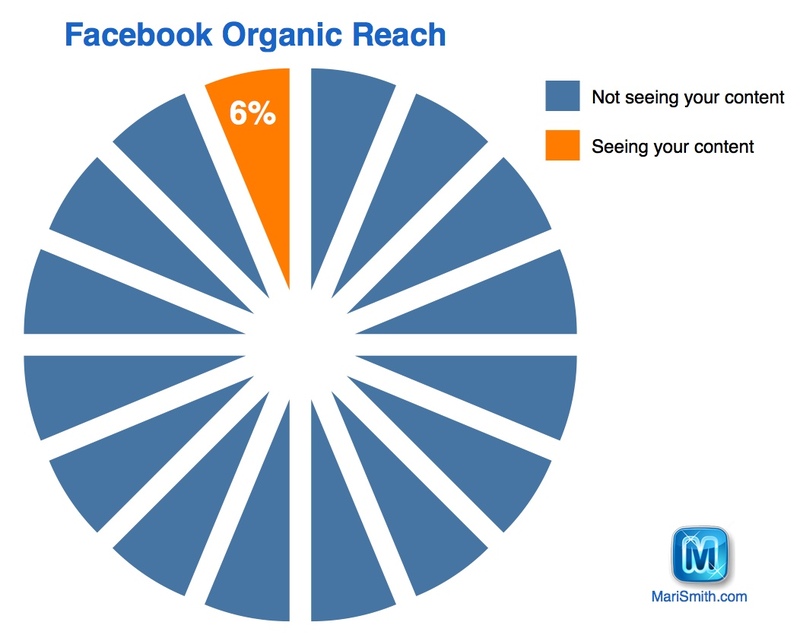 The problem with Facebook organic reach can be summed up in one single graphic: Only 6 percent of your fans are seeing your content in their news feed. The other 94 percent are not. Some sources indicate that organic reach may drop to 1-2 percent in the near future. Others say it’s destined to hit zero; it’s only a matter of time. These stats are a big drop from the already low 16 percent that Facebook indicated back in April 2012. What is causing the decline in organic reach? The average number of Facebook friends users have is 338 (that’s a big increase compared to 130 back in 2008). 15 percent of Facebook users have more than 500 friends. There are between 1500 and 15,000 pieces of content that Facebook could potentially show in your news feed each time you log on to the site! The Facebook news feed ranking algorithm (some folks call this formula ‘EdgeRank’) uses more than 100,000 weights* to determine what you’ll see. Ultimately, out of the 1,500 – 15,000 potential stories, Facebook passes them through the mega algorithm and displays approximately 300 stories in your feed. *Examples of weights: how many mutual friends like the person/page/content, how often you interact with the person/page, when the post was published, when the last comment was made, what types of content you typically interact with: watch more videos and Facebook will show you more videos, like more links and Facebook will show you more links. Up until around mid 2013, business users had a wonderful free ride on Facebook for about six years. Now, Facebook is definitely pay-to-play. Thing is, let’s compare getting into the news feed of more of your Facebook fans to getting on page one of Google. If you were to set your sights on being among the TOP organic search results on Google for your best keywords, do you think that would cost you money to do so? Absolutely! You’d need to hire an experienced SEO company and invest quite a bit of time to see results. Sure, you might get lucky and get instant indexing for a top keyword… but can you sustain that over time? Likely not. Good organic search engine results takes time…and money. It’s the same with good Facebook news feed visibility now. It takes time to find the right style, topics, cadence and interaction with your audience. You’ll pay to boost/promote some content and sometimes it can be hit or miss. Keep persisting, though. Can you still get a spike in organic reach? On my own Facebook page (currently with over 134,000 fans/likes), I used to regularly see organic reach in the 50,000 range. Then, that started dropping in the fall of 2013; my average reach in Q4 was down to 33,000. And by the end of Q1, 2014, I was seeing an average organic reach of just 8,500. 🙁 Ouch, I know. Fortunately, I’ve seen it bounce back up a bit over the past few months with the additional changes to the news feed algorithm (reduction of spam, memes, etc). And, ever-determined to persist with creative organic methods (hey, I’m Scottish and have frugal genes, lol! ), I recently published my most popular post, reaching a whopping 129,000 organically. It’s been well over a year since I last saw reach that high. I simply shared a great piece of “OPC” (other people’s content): an excellent blog post by the good peeps at Buffer! See: The Complete Guide To Growing Your Organic Reach. Publish time: I shared the post at 7:30AM Pacific time on a Sunday morning. TIP: Experiment with posting outside business hours. Gap in posts: I usually post once a day, sometimes twice. This time, I hadn’t posted anything for three days (I was off the grid at an event and hadn’t pre-scheduled any posts). TIP: It may help boost your reach at times by leaving a bigger space between posts. It seems counter-intuitive, but give it a try! Fans don’t necessarily want to see content every day from business pages. Short narrative: I often tend to be really verbose. But my fans are used to that. TIP: Mix up your post length; try long and short. Photo post: Even though there is a link with the narrative, Facebook reads this as a photo post which tends to get greater news feed visibility over links. Although links are on the increase. Status updates without the link preview can get good reach, too. TIP: Publish a variety of post types. Try roughly 50% photos, 25% status updates and 25% links. Hashtags: These may or may not make a difference, but I typically like to include 2-3. No CTA (call to action): I’m normally a huge fan of always including a question or invitation to comment, click, like, share. But I don’t recommend doing so with every single post. TIP: Keep it simple. Trust that your fans will naturally want to share/engage with really good, relevant, timely content. This post has over 850 shares and counting. Stay on topic: FOCUS = Follow One Course Until Successful. I rarely deviate from the topic of Facebook marketing (and other social media marketing) content on my page. I’ve tried in the past and my fans just do not engage as much. TIP: Go an inch wide and a mile deep with your subject expertise. Don’t try to be all things to all people. Here’s another great example of a helpful post on organic reach that I shared on my Facebook page, using many of the same parameters mentioned above: photo post with a link, published at 8:30PM Pacific Time on a Monday evening. This one got just under 53,000 reach in April 2014. Let’s round up some further practical tips that have been working well for me and can hopefully benefit your page, too. These tips originally appeared on this Facebook post. Post more often – at least three times a day. * (However, you may find your page works better with less – you have to experiment). Experiment with posting at different times of the day, including outside business hours. Post a mix of your own content (short tips + links to your longer blog posts) + OPC (other people’s content that you curate from a variety of sources). e.g. for Facebook-related content, follow this Interest List with 36.5k+ subscribers! Post directly on your Page and also share posts from other relevant Pages. Include @ tags of related Pages in your posts. This may help create more visibility in the news feed of the fans who have liked the tagged pages. Don’t over do the @ tags, though, and always remember your etiquette. Repost your own evergreen content. Mix up the post types: status updates, links, photos, videos, offers, events, milestones and cover image changes. Test post length from super short (<120 characters) to much longer (63k is the max!). Check your Insights for when your fans are online and be sure to post during these times (as well as outside, per tip #2). Consider coming up with a theme for each day of the week and publish posts pertaining to that day’s theme. Also, look for ways to crowd source content and featured input from your fans. I trust you’ve found many valuable nuggets here! Is so, please do share this post with your peeps. And leave me a comment below. P.S. After a one-year hiatus from publishing blog posts, I’m delighted to launch my brand new website design this week, and get back on track with a regular blogging schedule. Yay! Stay tuned for more posts from myself and guest bloggers. 🙂 We currently have a waiting list of guest bloggers. However, if you’d like to write for MariSmith.com, please do submit your request here and my team will be in touch. NEW online training course! 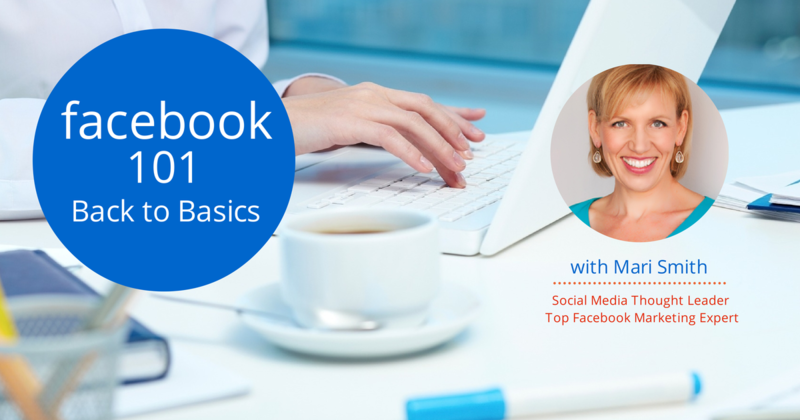 Facebook 101: Back to Basics. Due to popular demand, I’m launching a super-basic online training course on how to make the most of your every day Facebook activity. Find out more and get on the early-bird notification list here!